It was great to be asked to write an article for the Herb Society magazine Herbs earlier this year. The article has just been published in the September issue. 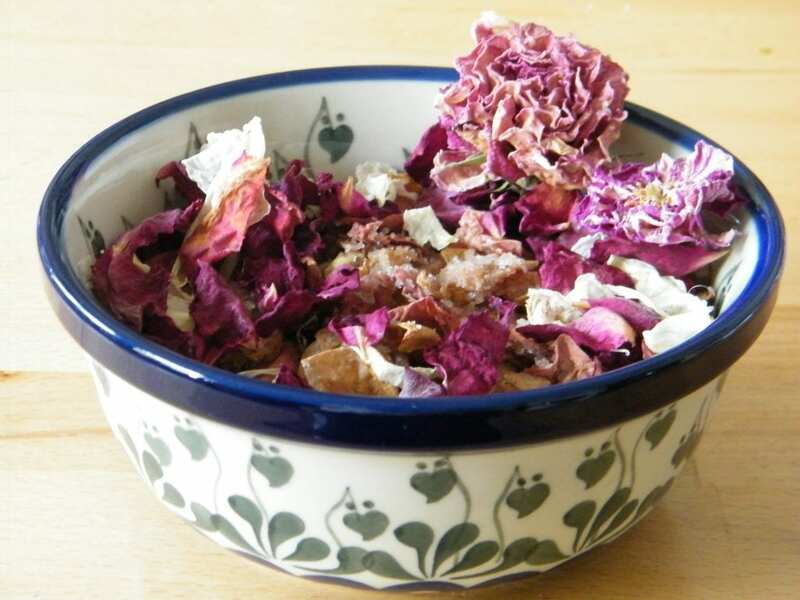 Preserve the fragrance of your Summer garden using this traditional potpourri making method. The wet method of potpourri making is little used because the result is not very decorative, but it can produce a really exciting perfume. I top mine with pretty dried flowers from my garden. (Wet potpourri is not to be confused with simmering potpourri where fragrant ingredients are boiled on the hob). 1. Pick four cups of scented petals from your garden. I chose rose petals stripped from the bud. 2. Allow your flowers and leaves to wilt overnight, but do not dry them further. 3. Layer in a glass or ceramic straight sided container such as a kilner jar. In between each layer of petals, sprinkle salt, spices and a drop or two of essential oil. I used mixed spice powder, and rose and lemon essential oils. 4. Press the layered mixture down with a weighted saucer to remove air pockets, seal tightly, and leave to cure. 5. Stir after two weeks, and after 3-4 weeks the potpourri is ready to use and will have shrunk to about one cupful. 6. Display in a glass or ceramic bowl, with dried flowers decorating the top if liked, refreshing as necessary with a drop or two of essential oil or pure alcohol.